a new library and children’s centre. A visit to the doctor’s could be combined with a visit to the library. A parent taking a one child to the crèche may need to take another to the baby clinic. After a visit to the doctor there is a pharmacy on the doorstep for prescriptions. The idea is to offer an integrated approach to people’s needs – a building that truly serves the diverse, but interrelated needs of the local community. Set in the heart of Pelsall alongside the Common this building offers a bright and welcoming entrance space. People arrive at the centre of the building, in the new library. Adjacent to the library, they find the children’s centre and primary care clinical facilities. 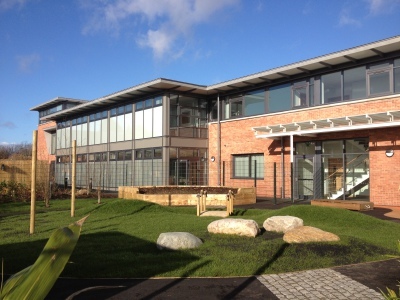 On the first floor there are further clinical facilities and four GP Surgeries, arranged around a waiting room - a high, top lit space with views out towards the common.